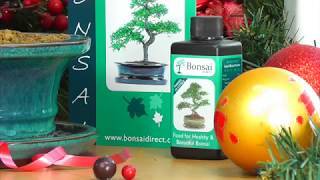 Cracking little Christmas indoor bonsai tree set with drip tray, pruning scissors, feed & care handbook. Free delivery available - please choose the delivery date at the checkout. Lovely Merry Christmas log pick. Perfect for friends & family. Full care instructions are included and you may select the bonsai vareity from the dropdown box below. All varieties are suitable for indoors. Gift wrap and personalisation options start at £1.50 and are listed below. Choose the variety of bonsai tree.